Accommodated in a neo-Baroque building, the Muzeul de Arta consists of some of the best art pieces around the world. The place has a collection of sculptures, rugs, décor items, paintings portraits, glass ware and a range of other artefacts. The Muzeul de Arta is best known for its collection of art works of the National Gallery (including anonymous pieces of the 18th century ) and art pieces created by Theodor Aman, Stefan Luchian , Theodor Pallady , Nicolae Tonitza , Octavian Bancila , Iosif Iser , Ion Andreescu , Ion Tuculescu , Francisc Sirato , Alexandru Ciucurencu, Stefan Popescu , Jean Alexandru Steriadi, Nicolae Grigorescu and Nicolae Darascu. Apart from these, the place also showcases exhibits containing art woks by Salvatore Dali and Maz Ernst among others. European and Oriental Decorative Art pieces including porcelain and glass pieces. Temporary exhibits and events held here. Gorgeous pieces of Romanian art from the early 19th century to the post-war period. Portraits made by Brasov’s contemporary artists. Collection of Tapestries and Oriental rugs. People with disabilities benefit from free access. Guided Tours: arranged from Tuesday to Friday, between 10.00 am and 4.00 pm, only with prior appointment. Some nice new additions. Some old see it in every art museum stuff. Really polite and helpful staff. Don't get the commentary tape tour.. I've been here during an ex-libris exhibition honoring Constantin Brancusi, the greatest Romanian sculptor. Such an unusual way to display the art! Pretty funky and unusual little art museum spread over two floors featuring exclusively Romanian painters and sculptors. The museum is slightly grotty compared to what you may expect to see in the West, but it is very inexpensive (10 lei/person) and the art is of quite a high quality. 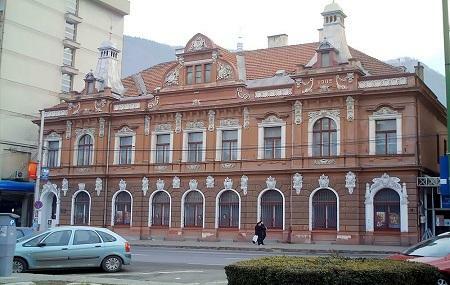 Very interesting art museum at the heart of Brașov. Most of the Romanian greats are there. Very good audio guide provided that offers info about each artist's life and art. It would be very helpful if the year of creation was written next to each exhibit in order for the visitor to be able to place it in the timeline of the artist's evolution as described in the audio guide.